Preheat oven to 350 °F (177 °C). 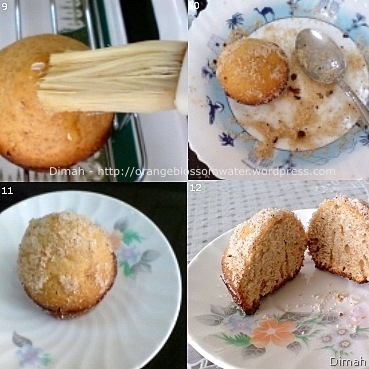 Lightly grease a muffin tin with cooking spray or vegetable oil. 1. In large bowl sugar and egg. 2. Whisk flour, baking powder, nutmeg and cinnamon. 3. Beat sugar and egg until light in color. 4. 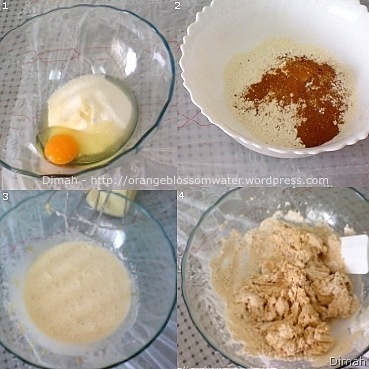 Pour flour mixture to egg mixture and stir to combine. 5. Pour in vegetable oil, milk and vanilla extract. 6. Divide batter into 10 muffin cups. 7. Bake at 350F = 170C for 15 – 18 minutes. 9. Brush top with melted butter. 10. 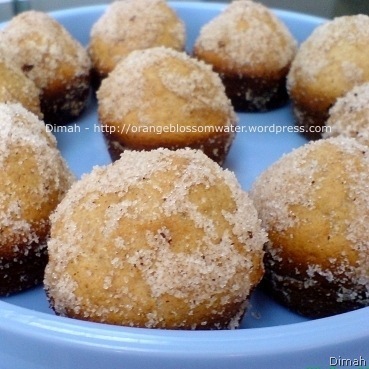 Roll in sugar cinnamon mixture. In a small bowl, whisk together flour, baking powder, salt and nutmeg. Pour into egg mixture and stir to combine. Pour in vegetable oil, milk and vanilla extract. 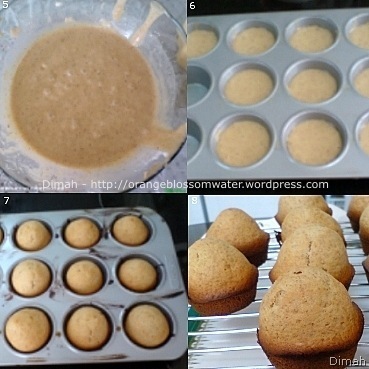 Divide batter evenly into 10 muffin cups, filling each about 3/4 full. Fill with water the two empty spaces in the pan. Bake for 15 – 18 minutes, until a tester inserted into the center comes out clean. This entry was posted on Saturday, February 28th, 2009 at 5:30 PM	and is filed under Baking and Desserts. You can follow any responses to this entry through the RSS 2.0 feed. You can skip to the end and leave a response. Pinging is currently not allowed.